I went through a phase as a middle schooler where I found ants FASCINATING. Choosing one ant and following its circuitous path from Rock A to Twig B and into Hole C was a thrill. Well, perhaps something less than a thrill, but nevertheless an activity that allowed for all sorts of daydreaming that looked vaguely scientific and purposeful. Which, incidentally, is a trick I'm still really into. "Soooo, I was looking at these ants carry their dead the other day--they're, like, totally my favorite in the family Formicidae--and I wondered if you, like, enjoyed Lou Bega's 'Mambo Number 5' as much as I do?" While that would have been admirably brazen of me and these days I'd be delighted if someone greeted me that way, I trust in my then-12 year-old's ability to sniff out scenarios of possible derision and public mockery. But here's the thing-- ants are still amazing. They are absolutely incredible creatures. I won't harp on the myriad species crawling, flying and chomping all over the planet; I don't know enough entymology and I can already sense people's brains growing a layer of fuzz. What I will do is share what the ants recently taught me they know how to do, and they do it really, really well. We seeded a lettuce bed in early September, anticipating the cooler weather that (hopefully) would find us as Fall began to turn. Our method of growing lettuce is suited to selling salad mix rather than heads of lettuce. This means that instead of growing lettuce individually in trays in a greenhouse like we do tomatoes or kales, we sow it directly. 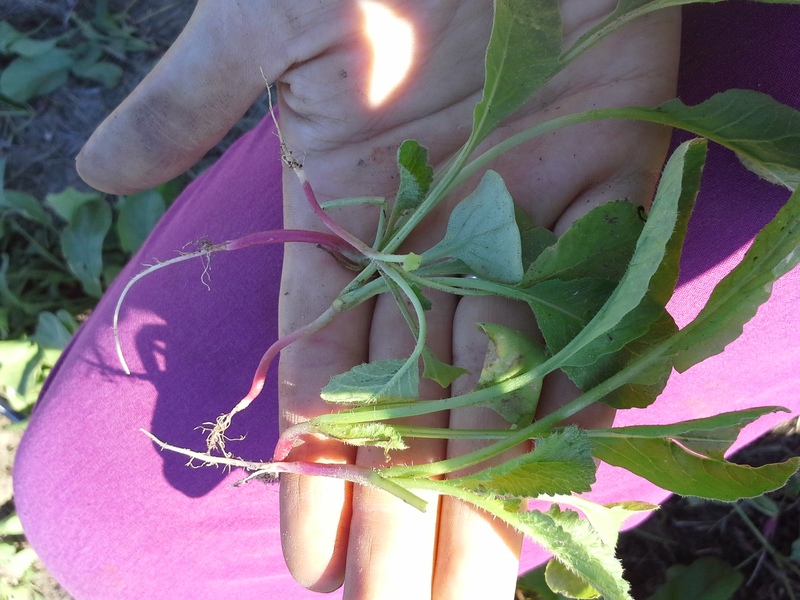 The thinned-out radish sprouts post-thinning. I make 4 narrow furrows down the center of the bed and then walk along, dropping hundreds of lettuce seeds into the little trenches. There are all manner of machines that help this task along, but for now we do it all by hand. All the seeds end up close to one another without much space in between. This method is used with lost of different crops. Yet most of these require thinning later on, which means squatting alongside those thickly sown rows of sprouting seeds and removing every other one or so to allow the left-behind sprouts the ample room required to grow into yummy, appropriately-sized carrots, turnips, beets and so on. However, with the salad mix lettuce, we just let that lettuce grow thick, into a lush blanket of soft leaves crowded together in deep reds and lime-greens. When it's time to harvest, you grab your farmer's knife or a pair of scissors and snip snip snip! Give the blanket a haircut and eat the spoils. Alex and I love salads, and our customers do too. We were getting extremely jazzed to start bringing lettuces to market and to our own dinner bowls. But, do you remember how incredible ants are? Remember how thorough, inventive and determined ants can be? They love working, they love serving the colony, and they love-- say it with me-- lettuce seeds. The lettuce beds with empty furrows. A few weeks passed and our beds looked...funky. In some spots the germination was fantastic and the plants robust. But across most of the bed there was nothing. Not even a sign of germinated seeds that had succumbed to the nighttime munchies of a rabbit or caterpillar. At first we cursed the quality of the new seeds we'd bought, but it was clear that something else was afoot. It's too odd to have 10 ft of perfect plants followed by 50 ft of empty soil, another clump of beautiful lettuce and 40 more feet of emptiness. The newest bed of lettuce!...Or at least, what's left of it. So we poked around the field, looking for clues like the two overall-wearing gumshoes we are, and wouldn't you know it-- we found large patches of lettuce growing densely amongst weeds on the edges of the field. There were about 4 of these strange bouquets sprinkled all over, some of them nearly 20 ft away from where the lettuce was originally sown. Alex wondered if the hard rains we'd had could have washed the seeds to these far-flung spots. I worried that maybe I'd left them too exposed on top of the bed after sowing--maybe they'd blown away. But no. And then, below the lettuce ball, there they were. The ants spilled out from their disturbed nest, scrambling every which way like liquid with legs, just as anyone who's ever stepped foot in Texas has seen a hundred times over. Seeding the new lettuce bed with hopeful hands. These ants had harvested our lettuce. I'd never seen such a thing. Consulting with an ag expert far more knowledgeable than me confirmed it was true; turns out ants do this all the time in Texas. It makes sense--they're thirsty and hungry, seeds are a common staple of their diet, and we were kind enough to open up their very own Golden Corral. At first we were indignant, then we laughed, and finally felt relieved that at least our new seed wasn't faulty. All the seed had germinated, just not in the spots we'd planned. ...And I'll let you know which species gets the buffet this time.